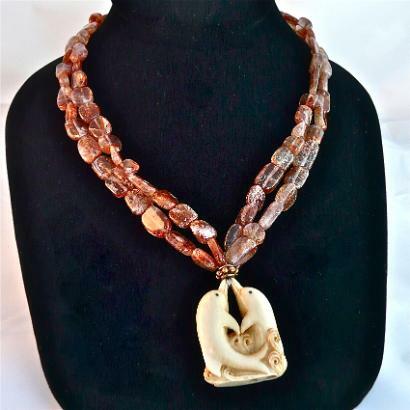 Approx 18 1/2" long, pendant 1" x 1 1/2"
This carved mammoth ivory double fish nestsuke is strung with a double strand of beautiful iridescent sun stone nuggets. The color and the sheen are really gorgeous. The mammoth is carved on both sides and lays flat. I have finished the necklace with a 18k gold vermeil hook clasp. Japanese artists starting in the 17th century cleverly invented the miniature sculptures known as netsuke to serve a very practical function. Traditional Japanese had no pockets. Men who wore them needed a place to keep personal belongings such as pipes, tobacco, money, seals, or medicines. They kept them in a pouch or box that was suspended from a cord and netsuke that was used as a counter weight as the pouch hung over his sash. Such objects, often of great artistic merit, have a long history reflecting important aspects of Japanese folklore and life. Netsuke production was most popular during the Edo period in Japan, around 1615-1868. Today, the art lives on and carvers, a few of whose modern works command high prices are in the UK, Europe, the USA, Japan and elsewhere. Prices at auctions in the USA for collectible netsuke typically range from a few hundred dollars to a few thousand depending on the quality of the carving and the artist. Traditionally, netsukes have been carved from mammoth and elephant ivory, ebony, fossil walrus tusk, mahogany, rosewood and hippopotamus tooth. The netsukes, often signed by the artist, are getting harder to find as the detail in each piece takes patience and time. Sunstone is formed in molten lava and is discharged onto the surface with the help of a volcano. The lava weathers away or is broken. 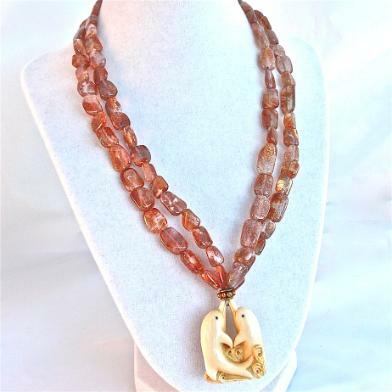 Fine crystals of sunstone is then released. In ancient times, this stone was used by natives for barter. It was also believed by the Vikings to be a talisman for navigation.